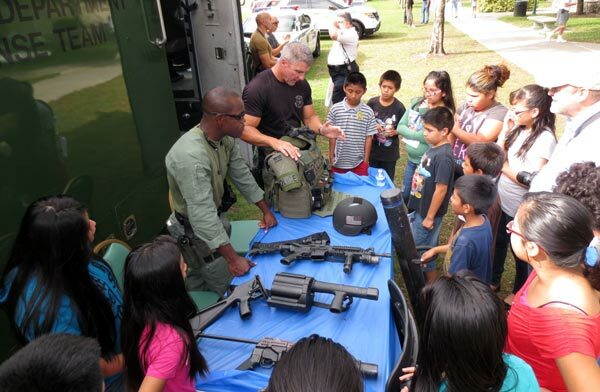 On Saturday, December 8th, after a multi-year absence, the Pinecrest Police Department once again hosted a Public Safety Day at Evelyn Greer Park. The event not only served as a way for residents to learn about the many facets of public safety and programs available to them; it also was the first public meet-and-greet with the newly promoted Police Chief Sam Ceballos, Jr.
“Right after I was promoted, I spent 10 weeks away at the FBI training academy,” said Ceballos, “This didn’t give me a chance to meet the community. The Village Manager and I felt it was important, so here we are.” The Chief, along with many of the officers, community service aides and other Pinecrest employees were pleased to see so many of the residents come out. In these days of social media and our ever more electronic society, Chief Ceballos is championing some new initiatives to ensure that the community can stay connected to their police department through technology. “We have a Facebook page, we are providing crime data to CrimeMapping.com where residents can review everything that is happening right around their home and we also have Nixle.com where we post announcements and residents can sign up to receive live alerts via SMS or email. This allows us to communicate in real-time for urgent messages that can help us fight crime.” In order to get the word out, the Pinecrest Police Department has added front-facing license plates to all their vehicles promoting their Facebook presence. Avi Diamond (age 3), who attends Bet Shira Early Childhood Center, was in awe around the new Pinecrest motorcycles. But then Chief Ceballos showed up and his attention quickly turned to shaking his hand and getting a photo with him. Among the tons of equipment on display twins Jake and Michael Arnold (age 6) said the helicopter was the coolest thing there. Another favorite seemed to be the Presidential limo. Several groups stopped by the car to get a demonstration and information. The Miami-Dade Fire Department brought out their 75-foot ladder truck and countless other organizations provided information, demonstrations and showed their wares to all who attended. Besides the public safety booths and demonstrations, there were bounce houses, martial arts presentation and Power Pizza ran tons of pizza from their location across the street to the hungry families who came out to see their public safety figures.